Previously I spoke about creating Fake Weld Joints. This basically involved heating up some wire and running it along plastic or using excess glue and allowing it to squish out of a join so that it's obviously been connected. Here, I'm going to talk about creating the final type of welding you'll probably be interested in at a miniature scale, and that's solder welding. In traditional welding, you get two pieces of metal so hot that they melt and flow together, fused as one when they solidify. This is how plastic glue works to connect two plastic pieces, except instead of heat, it's just melting the plastic. When you're welding with solder, it's like using super glue rather than plastic glue. The solder bonds to each part separately and is the "glue" that holds them together. First, there's the solder, or the "glue". You don't melt the metals - you heat them up until the solder fuses to them. Resin or flux core solder works best as it helps to clean away dirt, oil and such. Traditionally, it's often made out of lead, but many eco-friendly countries are requiring manufacturers switch to silver based brands, a more expensive environmentally friendly option. 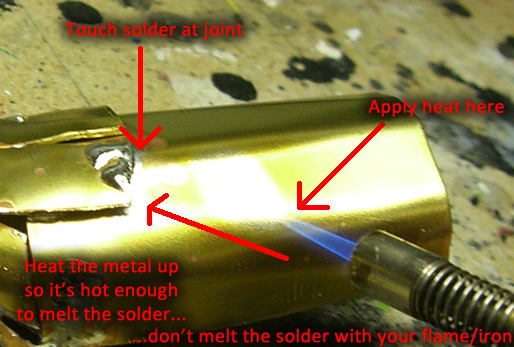 Your soldering iron is what is used to heat the metal up. You can get cheap ones like this at hardware stores. (~$50, less on sale) This has two "wattage" settings that basically means "really hot" or "really really hot". This is enough for most hobbiers, but for $150-200+ you can get really nice irons with fully adjustable temperatures. Use a sponge while you work to clean the tip, and when you're done "tin" the iron by melting some solder on the tip before powering it off. 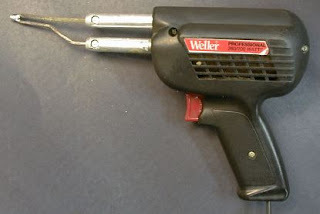 A soldering gun is usually overkill, but might be useful in large solder welding projects as they get REALLY hot. Usually much hotter than irons. This makes them a poor choice for finer detail projects. No matter which you buy, they get HOT. Hot enough to burn you - FROM THE TIP TO THE HANDLE. The entire metal length of the iron heats up, so be careful. Even your insulated grip can get pretty hot over extended soldering periods, especially with cheaper irons. A butane torch (as previously discussed) is also useful. (Don't buy a butane soldering iron, they're a waste unless you won't have access to power.) They can heat metal while keeping it clean or smooth out existing joins. You'll also need metals to solder together. Brass and copper work quite well because of how well they conduct heat. Metals need to be able to get hot enough that solder will bond to them. A small pair of Tin Snips will allow you to cut most light metals. Flux, (not pictured) is an acid (usually light) that can be put on a surface before soldering. The acid cleans away dirt, oil, etc to make for an easier bond. If you're going to buy flux, also buy flux remover - water doesn't clean up acid and instead spreads it... this is especially good to know incase you spill some on yourself. Touch some solder to the tip of your iron to get a small bead of molten metal. Touch the tip of the iron, with the bead, against the surface you want to heat up, NEAR but not exactly at the join. The bead has more surface area and bonds right away, transferring heat quicker. The metal is now heating up. As you become more experienced, you'll be able to have the iron and solder practically next to each other. You'll use just the tip of the iron, a smaller (if any) bead, only heating up the metal directly around the iron's tip. You'll be able to move the iron's tip from one part of the join along the crack, leaving a fine trail of solder behind it, only heating up the little bit that you need. You can pre-solder a join by placing solder all around the area to be connected, placing the part you want to connect overtop, then heating it until it fuses to the solder. Pictured above, I first placed solder around the hole, bonding to the first part. Then I covered the hole with a piece of metal. Finally, I placed my iron against the square. The iron heats up the square. The square heats up the solder it's laying against. Once the solder is hot enough, it melts and bonds to the new square. With more experience at this, you can pre-solder both parts, then only heat up around the edges. This means less heat is required and your entire part won't heat up - leaving existing joins alone. When you're making multiple joins to one piece of metal, things start falling off or shifting because the heat is spreading too far and melting all the solder again. 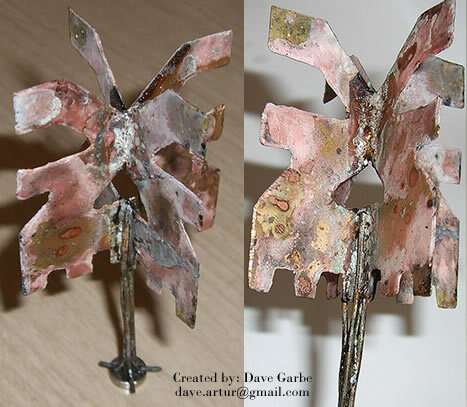 Be very careful not to overheat, heat the metal as close as you can to the new join. You underheat the metal and solder doesn't stick. The metal wasn't hot enough to bond to the solder AND/OR you touched the solder to the iron so the solder melted, then took the iron away. The solder probably created a small bead on the metal, if at all, and falls or pops off. You overheat the metal and solder won't stick anymore. The solder pools on the metal, instead of merging. You can peel the solder off. Yup, you're done. You can try a metal brillo type soldering iron cleaner or flux (acid) to clean it and try again, or best to toss that part and start over. As I mentioned above, with practice you'll be able to heat up just a small part of the metal. When you heat a large area with the iron, or if you're using the torch to smooth the solder out, things can shift on you. The unfortunate thing here is now you need to heat that whole area up and use something metal to push the piece back into place or remove it and try again. If you're having problems with too much heat, take brief breaks between each joint to give the metal a chance to cool down. That way, every time you start welding, your old joints won't be already near hot enough to melt their solder. You can use water to cool it faster or even ice if you're really paranoid about overheating. Another method of soldering is to use a torch. A torch is great at heating up a large area at once. In the example above, I've used a torch to heat the whole scoop. Then, I can just run my solder along the crack I want to connect and it fuses right to everything. Using an iron can create thicker welds with obvious or larger edges. Something else a torch will do is smooth out existing solder joints. Something else you can do is tack things in place before doing the real weld. Because of the heat you're working with, you can't temporarily glue or sticky-tack parts together. If you make a few quick and small joints far away from each other, they'll hold parts in place. Then, you can work from side to side to side to side, applying more solder to fill everything in. Just keep in mind that if you apply too much heat, and the whole part heats up, your tacks will melt away. Above, I've tacked the top in place first, then gone around each side, closing the gaps up. Gaps are another thing worth mentioning - unless your parts join very closely, you'll end up with gaps. You can close these up, but you have to be extra careful about not overheating. Apply solder all around the gap. Let it dry and cool. Now try to apply more solder, expanding what's already there and sometimes teasing or pulling the existing solder out across the join. This can be very tricky, so always try to piece parts together as cleanly as possible. In the case of delicate or smaller parts, and areas with a lot of other parts you may need tools to put them in place or hold them while a weld dries. Because of how tricky this can be, it's a good idea to (as mentioned above) pre-solder everything. That way, all you have to do is heat the solder up until the solder melts, not until the entire part melts. In finer areas especially, I like to use the torch to melt and smooth out solder to make things look cleaner. Because I wanted this plow to appear welded together, I used my torch to heat the entire thing up, then drew boxed patterns on it with my solder. Now, couldn't you just imagine terrain like bunkers or even vehicles like rhinos and landraiders plated with this stuff?